The sun dawns on a huge group of excited teenagers all intensely engaged and excited by an opportunity to do science and engineering on Dec. 8. Eighty-Seven students in 24 teams from local middle and high schools compete to answer questions of their own choosing during this all day event. The students analyze and report their results. Their presentations are judged and awards are received. All are exhausted but eager and excited about how they will improve their experiments next time. 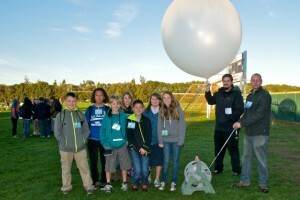 The Regional Balloon Fest was hosted and funded by Allan Hancock College thanks to Dr. Paul Murphy, the dean of Science. It was created and coordinated by the Endeavour Institute, an education non-profit working with our local schools to promote STEM (science, technology, engineering, and math) education. This event is a regional feeder to the annual Championship Balloon Fest in Paso Robles on April 20, 2013. More information is available at The Endeavour Institute click on Balloon Fest-Regional. Subjects: Allan Hancock College Education Event Photos Santa Maria Science!